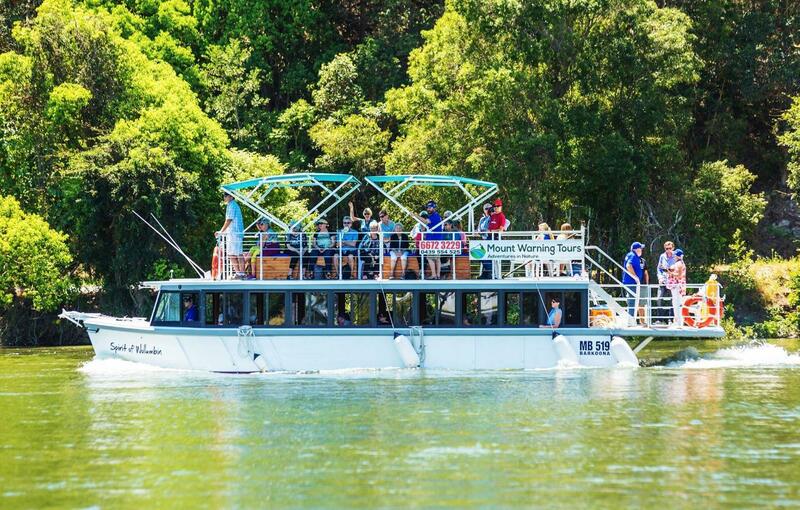 Explore the scenic Tweed waterways, whilst enjoying a Five Course Seafood Degustation, sourced by our on-board caterer, featuring local seafood, local produce and local bush food menu components. You will glide slowly through lush rainforest and view some of the Tweed Valleys unique local producers, distilleries and organic farms, on a delicious degustation cruise that will tantalise and delight all the senses. Experience the natural beauty of the Tweed Valley on the Spirit of Wollumbin. Beautiful Wollumbin Mount Warning, the heart of an ancient shield volcano, is best seen from the vantage point of the Upper Tweed Valley waterways. Whether you’re local or visiting, there is no better way to experience the tastes and flavours of the Tweed than on a Taste Tweed Cruise with Mount Warning Tours. Our Seafood Themed Dégustation is an appreciative tasting of a range of local seafood, local produce, garnished with Australian native foods. Serving five dishes that focus on the senses, the natural beauty of the Tweed Valley and match the good company of your fellow guests. Mount Warning Tours would like to take you on such a tasting; a journey of flavours and textures that will invoke delight and surprise.